Everything Elsea: My hopes are so high for this book that I'm writing about it before I read it. My hopes are so high for this book that I'm writing about it before I read it. I've managed to get in a lot of reading this summer. I think I've completed seven books since July. As I've told you before, I very rarely read serious books for fun and save my serious reading for wikipedia (there's a lot of information there on history and medical conditions and stuff). This summer's reading has mainly been British chick lit (Paige Toon...saving the rest of her books for the beach) as well as Anita Hughes' books (I won Lake Como from a facebook giveaway and just hadn't gotten around to it until this summer). Paige is very similar to Jill Mansell and Anita Hughes, while her three stories have very similar plots (rich divorcee in San Fransisco) they are good for an easy two day read. But this new book, Love, Nina, is different. For starters, People magazine told me to get it. So I put it on hold at the library thinking it'd be like The Nanny Diaries. Last night I sat down to start to read it (never did actually start it) and here's the thoughts and convos I had as a result of it. Sitting at the pool, I open the book. Oh, that's neat, there's a picture of an English Post Box in the inside. That's also weird since this takes place in New York. Maybe it takes place in London. So the author is from England. Oh, this does take place in London. The pictures make more sense now. So this books sounds pretty cool. Are the names the real names of the family she lived with? These are their real names. Hey, Mary-Kay Wilmers is the editor of the London Book Review. "C, didn't you just subscribe to the London Book Review"
"Well, this book is written by the editor's nanny. Have you ever heard of Alan Bennett?" I wonder if I should save this book for the beach. But I do need a book to read now. And I did just order more Paige Toon books from England, so maybe I should change things up and just read this. Great, Monkey is running away, I better catch her. So I didn't get the book started, but I fully intend to tonight. And I'm going to go out on a limb and say I liked it and go ahead and recommend it to you too. 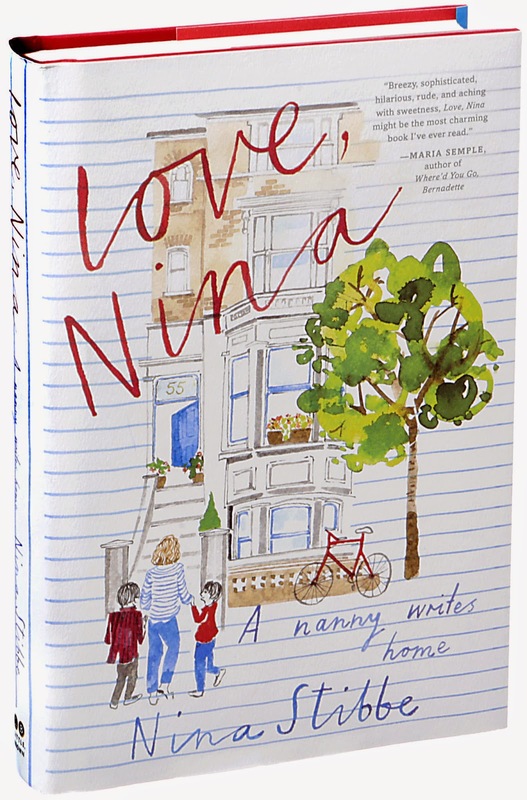 Love, Nina is one of my all-time favourite books - you will LOVE it!